According to a recent study by Chainalysis, a blockchain analysis company that specializes in building trust in blockchains, reported that around 4 million bitcoins are lost and are irretrievable. Hence, they are not in circulation and are just sitting on the actual numbers. In reality, out of 17,246,188 million mined bitcoins, we are left with only 3 million coins. And this accounts for lost coins due to lost private keys, Satoshi’s locked coins, and due to the HODLer’s death. 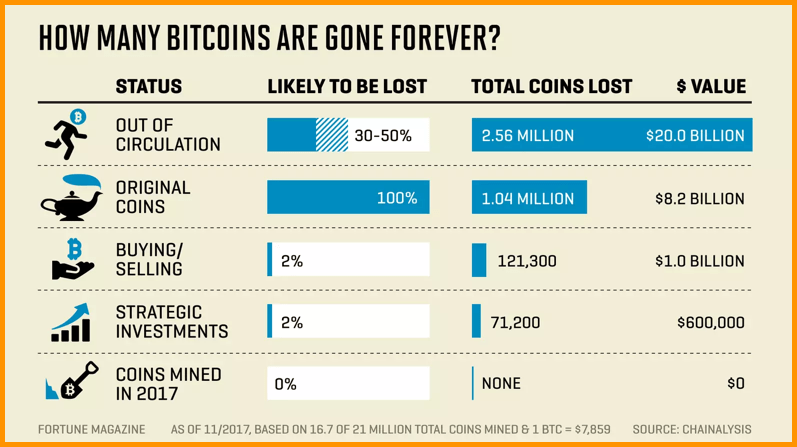 The fun fact is, even though so many million bitcoins are lost, there are still close to 3.7 million coins that are yet to be mined, and that over a period of over 100 years. Want to know more about UTXOs: What Are Unspent Transaction Outputs (UTXOs)? Take enough back-ups of your Bitcoin wallet or seed or private keys. Use Hardware wallets like Ledger Nano S or Trezor Model T for storage of coins. Make a plan assuming your death scenario as to how your family can retrieve your coins. Use reliable HD Bitcoin wallets for better management of your UTXOs. That’s all from my side in this article. If you know more facts that I may have missed in this article, please feel free to leave a comment.